In a major victory for solar power companies and their customers, California regulators voted to preserve an incentive program that has fueled the dramatic growth of rooftop solar in the state. The program, known as “net energy metering,” means that homeowners with solar are paid by their utility for the extra electricity they feed onto the grid when they make more than they need at home. “Our decision today is big step forward in giving California consumers more choice, more control and more responsibility over their energy choices,” said Michael Picker, president of the California Public Utilities Commission. The ruling comes after years of contention between solar companies and electric utilities over the future of solar incentives in California. Similar battles are happening in several other states, as solar continues to expand, eating into the electric utility business model. “We are extremely disappointed that the CPUC did not take the opportunity to meet the important goals set out by the state’s legislation," wrote PG&E spokesman Ari Vanrenen, in an email to KQED, "and make the smart energy reforms that are needed to ensure a sustainable market for solar in California." 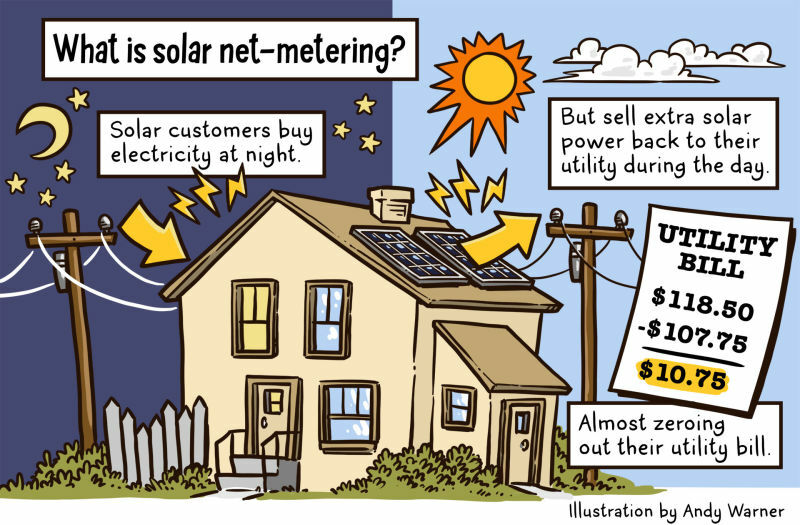 Net-metering often results in monthly utility bills that are close to zero for customers with rooftop solar panels. Consumers still buy electricity at night, when their solar panels aren’t producing, but they can largely offset that cost by selling electricity back to the utility at the peak of the day. California’s three major investor-owned utilities, including Pacific Gas & Electric, argued that the low bills mean solar customers aren’t contributing enough to maintaining the electrical grid, including transmission lines. As a result, utilities say that non-solar customers have to cover that shortfall by paying higher rates, subsidizing solar customers. Solar companies argued that those calculations ignore the benefits of solar power, which could help utilities potentially avoid buying electricity from power plants or building new transmission lines. By law, utility profits are tied to investments in infrastructure, not how much electricity they sell. Commissioner Picker admitted the decision, which he called “a painful, challenging process,” didn’t fully evaluate the true costs and benefits of solar. “This decision doesn’t get everything right but it gets us farther along,” he said. Utilities made a last-ditch effort to change regulators minds’ over the last month, but the final vote went against them, 3-2. The decision lies in stark contrast to Nevada, where regulators recently voted to overhaul the state’s net-metering program by increasing monthly fees for customers and reimbursing them less for their power. Solar companies are fighting the Nevada decision, but say it renders solar financially unfeasible there. 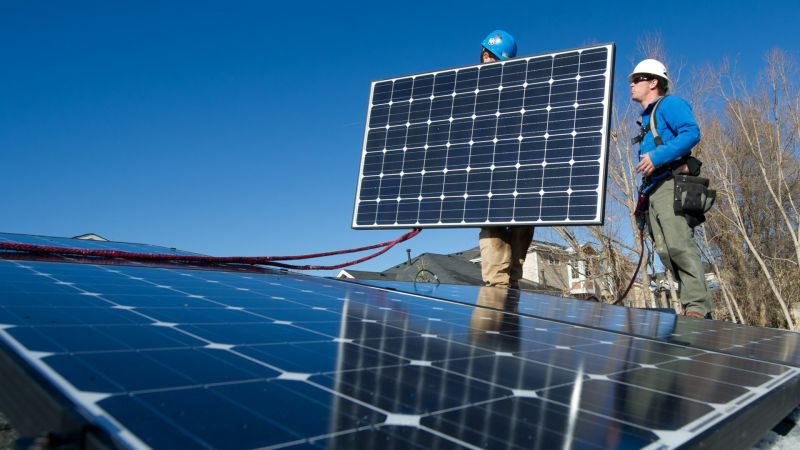 SolarCity announced it would eliminate 550 jobs in Nevada. “I think that this sends a big message to the nation, for California to stand up and say ‘we’re proud of the solar we have and want more’,” said Brad Heavner of the California Solar Energy Industries Association. The decision does, however, mean slightly higher rates for solar customers. New solar customers will pay an interconnection fee of $75-150. They’ll also pay a monthly charge on each kilowatt-hour of electricity they buy from their utility of around 2 cents, which would be in the range of $5-9 dollars a month for an average system. The CPUC says those additional charges will cover the cost of mandated utility programs like low-income customer support and nuclear decommissioning. Two of the five CPUC commissioners who voted against the decision wanted to see a charge for the transmission grid included in that. “Any system that benefits the few at the cost of the many can only subsist for so long,” said Commissioner Mike Florio. Current solar customers won’t be affected by today’s decision and are "grandfathered" into the program at their current rates for 20 years. New solar customers will also see electricity prices that change based on the time of day. Under “time-of-use rates,” electricity is the most expensive in the late afternoon and evening, when demand on the grid is highest. The solar industry’s win could be only temporary. The CPUC will revisit the net metering system in 2019. Some commissioners say they anticipate that by that time, a more “mature” solar industry may not need as much support.